Five years ago I could see in the work of my brilliant planning team in Arup that human development needed to make a radical course correction. I called the destination the ‘Ecological Age’ and the process Sustainable Development. At that time, the Millennium Development Goal (MDG) of reducing extreme poverty was being approached quickly around the world, with China playing a major role with it’s incredible development programme. It was clear, however, that we were starting to breach the limits of the Earth to support this fast track change, with resource depletion, pollution and ecological destruction. The science suggested truly awful consequences of this path, as population grew to around 10bn by 2050, with climate change making it increasingly difficult to provide adequate supplies of food and water. I met a great number of young people around the world motivated to support change, but without the means to make it happen. I decided that I would devote the rest of my life to creating the best decision making tools possible, to enable this course correction to be realised by everyone and to demonstrate that they really worked. 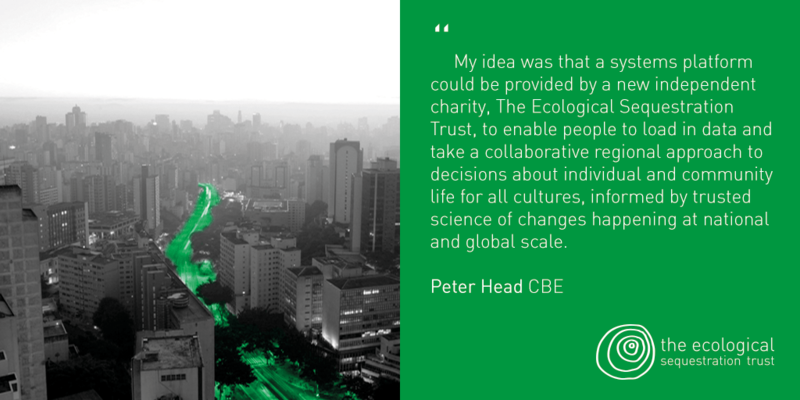 My idea was that a systems platform could be provided by a new independent charity, The Ecological Sequestration Trust, to enable people to load in data and take a collaborative regional approach to decisions about individual and community life for all cultures, informed by trusted science of changes happening at national and global scale. I knew that the world planned to set some goals to frame this course correction, when 2015 came around and the MDG’s were replaced, and hoped that our open-source platform might be helpful to provide an investment and decision making ‘compass’ to steer a path through this complexity, enabling future generations to find more resilient and sustainable outcomes for themselves. I firmly believed that the two missing parts of the tool-chest were the link between investment and human well-being, and between ecological systems health and human well-being. I needed an economist who understood how to frame and model these relationships to enable radical change. I was very fortunate to meet Hannes Kuntz from IIER at a Sustainable Development conference in London and he agreed to link up on our journey. The first thing he said to me was that even with such tools, he did not think we would be able to avert major problems as we had left the course correction too late. So we should aim to bring tools into use but make it clear they were as much about mitigating risk for the public and private sectors, as they were about steering into safer water. We called the platform resilience.io because of that philosophy. This challenging five-year journey, involving many of the world’s top professionals, has brought The Trust firmly into the Disaster Risk Reduction community, the Sustainable Development Goal community and those setting goals for Climate Change. We have also supported goal development, helped explain the science and worked hard to figure out what the practical needs are, particularly how to connect in finance and insurance. Our offer to provide a practical open-source decision making platform as a ‘compass’ to enable communities all over the world to anticipate and steer through disasters and aim and accelerate towards a more resilient and sustainable future has been increasingly welcomed. We are now confident we can provide the steering mechanisms and recommend the governance to go with them. We have learned on the journey that this approach must embrace culture and cultural heritage if this change is going to succeed, as in the end it is about communities and their lives in the places which are special for them. I have spent the last week in Kyoto teaching and learning about Disaster Risk Management needs, with cultural heritage experts from Sendai, Kobe, Tacloban, Chile, Bangkok, Accra, Bam and Nepal who have experienced terrible disasters and who know they need to prepare better for an uncertain future. We produced a report together, which may be useful to learn how culture and cultural heritage can be embraced within resilient sustainable development. So next week is a very exciting and momentous one, because it seems the World will sign up to a ‘course correction’ by agreeing the 17 SDG’s, which include the integration of risk and resilience planning, a focus on urban-rural systems and tackling climate change. I was very much involved in writing and fighting for urban Goal 11 and ensuring it included resilience and cultural heritage protection. The Trust will be there in New York City at this truly historic moment, standing by with a programme to complete building and testing a set of tools that will support making the ‘correction’ and take full advantage of the data, modelling and communications revolution. We are but a tiny part of a huge global effort to get the world to go forward in a comprehensive new direction for the first time. 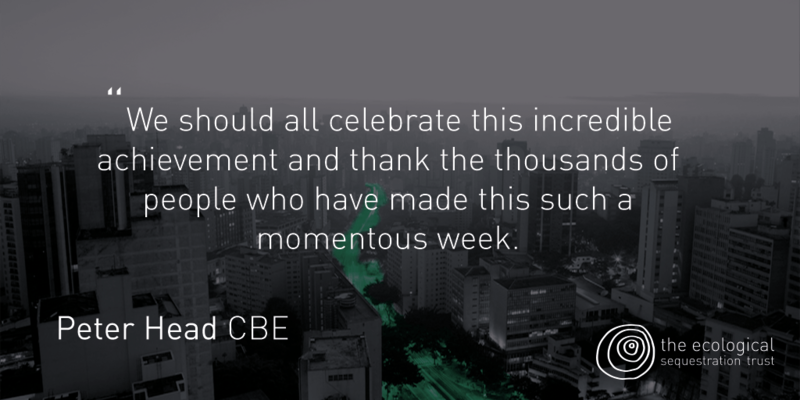 We should all celebrate this incredible achievement and thank the thousands of people who have made it such a momentous week. I would particularly like to recognise Jeff Sachs and his team at UNSDN for their outstanding leadership.